All Second Life® accounts have both a Linden dollar balance and a US dollar balance. You can see both balances in the Linden Dollar Summary on your Account page at secondlife.com. When you have a new Second Life account, your US dollar balance is $0. You can increase your US dollar balance by selling L$ on the LindeX. In rare circumstances, you might also receive a US$ credit from Linden Lab. 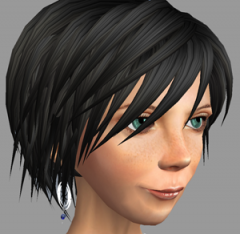 The L$ can be used to make purchases inworld or on the Second Life Marketplace; the US$ can be used for other purposes related to your account. You can put your US dollar balance to work in several ways, explained below. When you pay your premium membership fee, land use fees, private estate fees, buy Linden dollars or buy a Private Region, Linden Lab charges your US dollar balance. If your US dollar balance does not cover your expenses, all available US$ credit is applied to the fee. Then we charge the remainder via your preferred payment method. (Bill the full amount to your payment method by clicking "DON'T USE" next to your USD balance.) If you make enough Linden dollars, you can sell them on the LindeX to increase your US dollar balance. Some Residents' premium accounts pay for themselves! Update: As of June 6, 2016, Turkish Second Life Residents are unable to use PayPal to process credit on their US dollar balances. It is, however, still possible for Turkish Residents to make purchases or to process credit using Skrill. For more information about PayPal's suspension of operations in Turkey, please visit PayPal's website (in Turkish). Net proceeds from your sales of Linden Dollars remain as credit on your Second Life account, and this credit is automatically applied to your account fees as described above. If you do not wish to apply your Linden Dollar sales proceeds to your fees, you may withdraw this portion of your account credit through a real-world payment. (See Process Credit) Note that you may only process credit due to net proceeds from sales of Linden Dollars. Purchases of account credits and credits due to gift codes or other promotional account credits are nonrefundable, and may not be processed as a payment to you. You must be in full compliance with our Terms of Service to receive any payment through the credit payment process. This includes, without limitation, the requirement to have accurate and complete registration information, including verifiable billing information. Under certain circumstances, Linden Lab may request additional information from you before processing a request. If provided in a timely manner, this extra step should not significantly delay processing times. The following table provides an estimate for when you should receive your USD in your PayPal account based on the day of the week you submit your request. You should expect to see the USD in your PayPal account on or before the date listed. For most requests, you should receive payment to your PayPal or Skrill account within two business days. However, for a minority of requests, this process may take five business days. Business holidays in the US will extend the two or five business day window by one day. How can I withdraw USD credit from my account balance? You may choose to withdraw your US dollar balance via PayPal or Skrill. This is known as a process-credit request, because you are requesting to process credit from the Second Life system to your real-world account. Depending on which withdrawal option you choose, you may be subject to fees and minimum withdrawal amounts. How do I select a payout method? 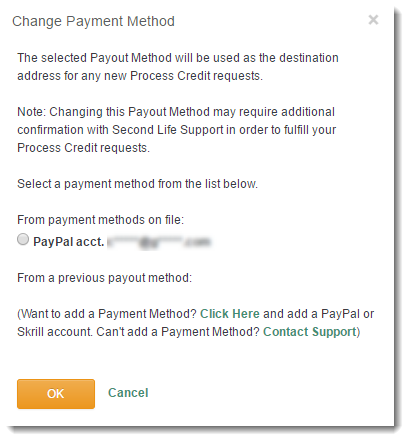 When you request to process a credit from Second Life to your real-world account using the new system, you will be required to choose a payout method. To place a process-credit request to PayPal, you will need to select your PayPal email address from the request form. The form lists the PayPal account(s) you currently have on file at secondlife.com, as well as the PayPal account that you used for process-credit requests (if you have made previous requests in the old process-credit system). To place a process-credit request to Skrill, you need to select your Skrill email address from the request form. The form lists the Skrill account(s) you currently have on file at secondlife.com, as well as the Skrill accounts that you used for process-credit requests (if you have made previous requests in the older process-credit system). Note: If you change your payout method, we may require additional information to verify your identity before we process the request. This verification is for your security. Can I send funds to someone else's PayPal or Skrill account? Process-credit requests must be sent to a PayPal or Skrill account that you control. They are not meant to be used to pay someone else. Is there a minimum or maximum amount? The minimum process-credit amount allowed is $10, plus any fees. The maximum amount per transaction is $9,999 minus fees. If necessary, you can process a larger amount over multiple smaller transactions. If you are permanently closing your account, you may request a withdrawal of the full US dollar balance, even if it is less than $10. This is the only circumstance where the $10 minimum does not apply. To begin this process, please contact Support for assistance. How much does it cost to process credits? There is a fee per process-credit transaction. It is currently 2.5% of the amount requested, with a $3 USD minimum; however, fees may change in the future. Fees are subtracted from the amount you enter in the form, so you will receive less than that amount in your PayPal or Skrill account. How long does it take to process credits? For processing a credit to a Paypal or Skrill account, requests generally take up to five business days (Monday-Friday, not including U.S. holidays) to be completed. We always strive for quick turnaround; however, holidays and the volume of transactions may affect processing times. Also, in the event that Linden Lab requires additional information from a Resident, the processing time will depend on the timely submission of the information by the Resident. How can I check on my previous and pending requests? To view a full history of your process credit transactions, see the Process Credit History page. Any recent requests that have yet to be sent to PayPal or Skrill will say "processing" next to the timestamp. If the request looks to have been completed, but you haven't received funds in your PayPal or Skrill account, please contact Support for assistance. How can I cancel a process-credit request? You might have entered the wrong amount or the wrong PayPal/Skrill account information when requesting a credit. If you think you've made a mistake, check your Process Credit History and then contact Support for assistance. You'll need to tell us which request is to be canceled (use the date/time and the amount to identify it). Please notify us as soon as you can, so that we can reverse the request and restore the funds to your account balance. Afterward, you may request the withdrawal again, or you may use the funds to pay Second Life account fees. Linden Lab is no longer able to accept payment from your bank via wire transfer. Please pay for balances through credit card, Paypal, or Skrill. Linden Lab is no longer able to support payment to your bank via wire transfer. If you wish to payout your USD balance, please do so through Paypal or Skrill. + "see instructions for setting up Process Credit `payment trough wire transfer" go to this same article. + "this article on wire transfers"
+ "I made a mistake in my request..."
Thanks, Irene! This article will be rewritten soon, but for now I've fixed the links (please comment again if I missed any). This is a very useful page. We get a lot of questions in SL Answers about how to sell L$ and then do a credit transfer. Unfortunately, it is almost impossible to find the page unless you already know that it is here. This ought to be one of the first things that pops up if you do a search for Sell Lindens, for example. Unfortunately, nothing helpful pops up at all. This page also needs to be available in each of the supported languages.